100! This is my 100th post on this blog! I know that's more than one a week, but at the beginning there was always so much to share and remember. There is sunshine in my heart today, as well as outside. A lot of the haze that has been hanging around has dissipated. We can actually see the sky again. This week the clouds were seeded, and we received some badly needed rain to help wash the air. It really helped. If you missed last week's blog, go back and look at the pictures I took directly of the sun. You'll see just how bad the haze was. It should be better from now on. President Chua told Sister Bodell that the winds change direction on the 20th of September. This will blow the remaining gunk away. This has been an uneventful week. Not much going on, except for zone meeting on Tuesday. Elders S and R (the ZLs) did an excellent job discussing personal revelation and what we can do receive it. They also discussed ways to explain revelation to the investigators. It was a meaningful, well-received zone meeting. Elder & Sister Mills were in Hong Kong attending the Temple with a group from Branch 3. What to do with a group like this? Elders R and P referred to us as Mom and Dad. It's been awhile since any Elders have called us that. It makes us feel good when we know we're loved by the Elders. It was also Elder S's birthday this week so Sister Bodell prepared a cake which was served at our zone meeting. 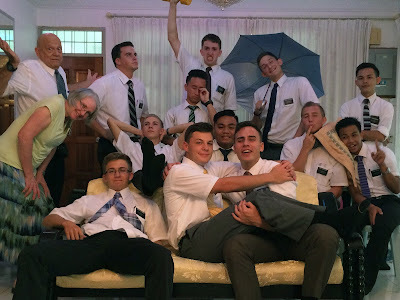 We went with Elders S and O out to Sister Bintang's this week. Sister Bodell gave Jackie a piano lesson and the Elders taught a discussion. I helped install printer software on their laptop. We had an extra printer that we needed to dispose of. Sister Bodell is breathing easier today. Not just because of the cleaner air, but because Branch 1 had their Primary program today. The Primary did a really good job singing the songs, and the kids with speaking parts spoke clearly so they could be understood. The paparazzi was as prevalent as last week in Branch 2, but I still would liked to have gotten my camera out so that we could it share when we get home. There was a really good spirit in the meeting today. The kids in Primary here are just like the ones at home. Some of them can get out of control, but when it comes to the program, they settle down and do their parts the way they should. It doesn't matter where you go. We are all children of a loving Father in Heaven who wants us all to succeed and return to live with Him. I am grateful for the Atonement of Jesus Christ and the love He has for us to take upon Him our sins and sufferings. I recently read the book, The Infinite Atonement by Ted R. Callister. This book has really helped me understand the Atonement much better and how it affects me personally. I love my Savior and my Father in Heaven. I just read Brother Callister's book too. I haven't made any birthday cakes, but I have made a lot of cookies for missionaries, and for families we visit.